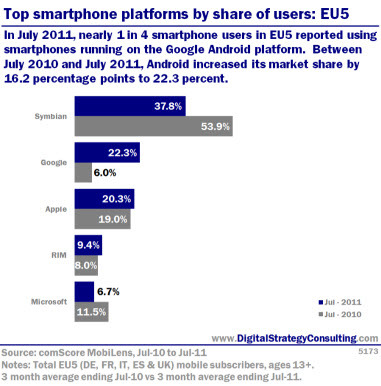 Entries from Digital Intelligence tagged with "symbian"
In July 2011, nearly 1 in 4 smartphone users in EU5 reported using smartphones running on the Google Android platform. Between July 2010 and July 2011, Android increased its market share by 16.2 percentage points to 22.3 percent. 82.2 million people inthe US owned smartphones during the three months ending July 2011, up 10% from the preceding three month period. 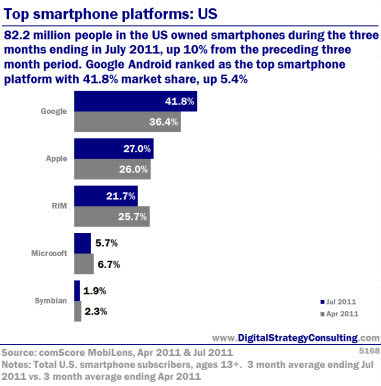 Google Android ranked as the top smartphone platform with 41.8% market share, up 5.4%. More than 80 million Americans now own smartphones, with Samsung and Android being the top manufacturer and operating system respectively, according to new data. comScore has revealed key trends in the U.S. mobile phone industry during the three month average period ending July 2011. The study surveyed more than 30,000 U.S. mobile subscribers and found Samsung to be the top handset manufacturer overall with 25.5 percent market share. Google Android continued to gain ground in the smartphone market reaching 41.8 percent market share. 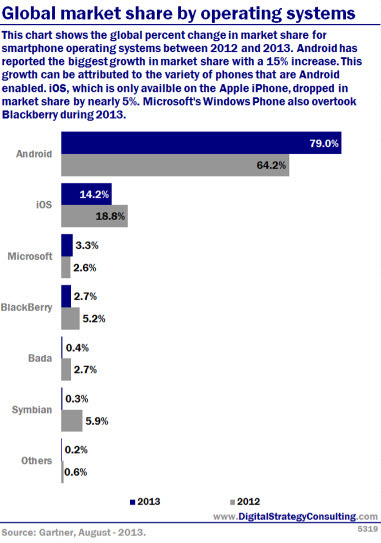 Although iOS development remains strong that the Android army is catching on fast, with developer interest in Android and Windows 7 growing at the expense of iOS, according to a new poll. GetJar, a free mobile apps store, has just completed its latest App Meter Developer Poll, surveying 300 developers across its network in collaboration with several of its ecosystem partners including Inmobi, Urban Airship, Device Anywhere and SV Android Meet-up. Although iOS development remains strong (80% currently developing for iPhone and 59% developing for iPad) that the Android army is catching on fast. 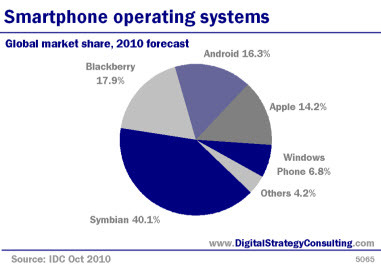 Global market share, 2010 forecast. Mobile software maker Symbian has made its smartphone platform open source, letting developers use and modify the platform's underlying source code for any purpose. Until now, the source code for the platform was only open to members of the Symbian organisation. The Symbian 3 platform, including applications, middleware, and the kernel itself, will be offered under terms of the Eclipse Public License and other open source licenses.